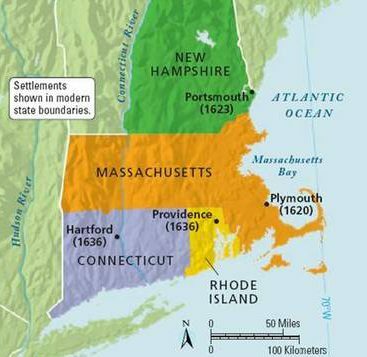 The church and state were interwoven in New England. Into the eighteenth century, the Puritan tradition continued in greater strength in Connecticut than elsewhere. The state taxed all citizens to support religion. In 1708, the Connecticut legislature ordained the Saybrook Platform. Under it, county associations of ministers met frequently to deal with matters of common interest, regional bodies called consociations were to handle all kinds of ecclesiastical difficulties, and a general state association exercised a general superintendency over churches and ministers. Under the Saybrook Platform, the county associations approved, licensed, and ordained the ministers of the parishes. The state supported the actions of the county associations, and could deny the right of a minister to preach and collect his salary. [SAYBROOK PLATFORM]. 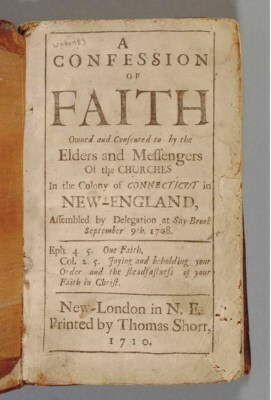 A Confession of Faith Owned and Consented to by the Elders and Messengers of the Churches in the Colony of Connecticut in New-England, Assembled by Delegation at Say Brook September 9th, 1708. New-London: Thomas Short, 1710. The inequities and the persecutions by the established church and civil government resulted in more and more defections to the New Light position. The civil government used repressive measures to compel the Separates to return to the fold. “Revivalistic ministers were shut out of meeting houses; members were moved from civic office and, when they refused to pay taxes for support of the regular ministry, imprisoned.” At first most Separates that left the state-churches seemed destined to become Baptists. However, great disagreement arose between those who still adhered to infant baptism and those who insisted upon believer’s baptism—baptism after a confession of faith only. Because of this disagreement, the Baptist members left the Separate churches and formed their own churches. William L. Lumpkin, Baptist Foundations in the South (Eugene, Oregon: Wipf & Stock Publishers, 2006), p. 11; Isaac Backus, A History of New England With Particular Reference to the Denomination of Christians called Baptists, Volume 1 (Eugene, Oregon: Wipf & Stock Publishers, Previously published by Backus Historical Society, 1871), pp. 472-474; Isaac Backus, A History of New England With Particular Reference to the Denomination of Christians called Baptists, Volume 2 (Eugene, Oregon: Wipf & Stock Publishers, Previously published by Backus Historical Society, 1871), p. 319. William G. McLoughlin, Isaac Backus and the American Piestic Tradition (Boston: Little, Brown and Company, 1967), p. 24. Backus, Volume 2, pp. 319-320. Lumpkin, p. 15; see also Backus, Volume 2, p. 57, fn. 3. Backus, A History of New England…, Volume 2, pp. 68-74; McLoughlin, Isaac Backus and the American Piestic Tradition, p. 26. McLoughlin, Isaac Backus and the American Piestic Tradition, pp. 26-27. Lumpkin, p. 14, citing Backus, A History of New England…, Volume 2, p. 176. Backus, A History of New England…, Volume 2, fn. 1, p. 64.